For those of you who might assume that by virtue of the fact that it’s referred to as “The Federal Reserve,” The Federal Reserve might actually be a part of and beholden to The United States Government, we’d just like to point out that Federal Express happens to be run out of Memphis, not the Pentagon, and that The International House of Pancakes wasn’t granted a charter from The League of Nations. So what exactly is The Federal Reserve? We’ve been looking into that mystery for years. Specifically, all the way back to 1913 when the Federal Reserve Act created the Federal Reserve Bank, and consequently, created a legal corporate entity empowered to do technically-illegal things. Well, whereas the United States Constitution plainly states - in Article 1, Section 8 - that Congress shall have the sole power to coin money and regulate the value thereof, the Federal Reserve Act delegated that enormous, fate-of-the-free-world responsibility to a privately owned corporation whose own self-serving interest is effectively the printing and loaning of debt-based, fiat money backed not by gold or some other commodity, but merely by the creepy-charm of The Conspirators who had secretly gathered at the famously exclusive Jekyll Island Club, located on a private island off the coast of Georgia, to conceive and create said-nefarious corporate entity. Incidentally, have you ever taken a good look at the money these guys print? 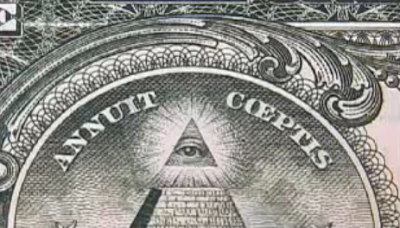 It’s filled with phrases and symbols that conjure up a vast, devious “New World Order” type conspiracy. But then, the theories have always persisted that The Federal Reserve was conceived and backed not merely just by a rogue’s gallery of the world’s most powerful handle bar-mustachioed ne’er-do-wells, but by the most dreaded-and-feared secret society of all: The Illuminati. And those guys are historically famous for not fooling around. “But how can a privately-owned corporation possibly control the currency of the world’s largest democracy and most powerful nation...” you ask? Interestingly enough, that question was raised by Congressman Louis T. McFadden, who - in 1933 - brought formal charges against the Board of Governors of The Federal Reserve. His colleagues in Congress referred his motion to the Judiciary Committee, which more than 70 years later, has yet to begin a formal inquiry. This dilly-dallying would have no doubt frustrated McFadden, had he not died of poisoning two years later. It took exactly 60 years for none other than President John F. Kennedy himself to address the issue. Kennedy, who was outspoken against secret societies, proceeded to sign into law on June 4th, 1963 Executive Order 11101 - which sought to strip the Federal Reserve of its power to loan money to the US Government at interest. Unfortunately, we all know how that turned out. Incidentally, with tax season upon us, it is not irrelevant to point out that when filing one’s federal taxes on April 15th, it is customary that the check be made out to not to The United States Government, but to The US Treasury, which then forks it over to The Federal Reserve.